These combination automatic changeover, two stage regulators are especially suitable for homes, mobile homes, cottages, construction and other portable two cylinder installations. Empty containers may be replaced without interrupting customer’s gas service. Automatic changeover switches from “service” to “reserve” cylinder automatically without interrupting service. The Second Stage Incorporates wide bonnet drip lip vent to guard against freeze-up when properly installed. With 15 PSIG inlet pressure the second stage, regulator is designed to not pass more than 2 PSIG with the seat disc removed. Allows “reserve” cylinder to supplement the flow of gas from the “service” cylinder during extreme load or severe cold conditions. 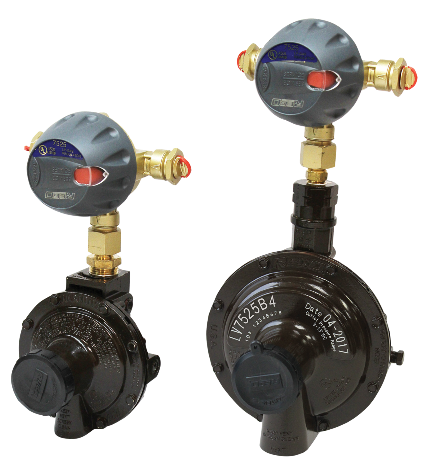 Incorporates molded diaphragm in second stage regulators. Change over knob and indicator are integral to the first stage. Select brown finish on first stage.